In The Communicative Construction of Europe: Cultures of Political Discourse, Public Sphere and the Euro Crisis, Andreas Hepp et al present the findings of a twelve-year research programme (2003-14) that sought to examine the ‘communicative construction’ of Europe through case studies of the news cultures of six European countries. This book valuably turns its attention away from European institutions and elites to instead listen to ordinary citizens’ views on Europe at a time of apparent crisis, writes Ruth Garland. 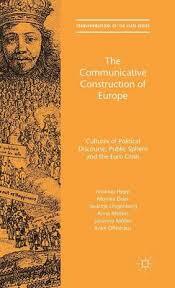 The Communicative Construction of Europe: Cultures of Political Discourse, Public Sphere and the Euro Crisis. Andreas Hepp et al. Palgrave Macmillan. 2016. The Communicative Construction of Europe: Cultures of Political Discourse, Public Sphere and the Euro Crisis is the outcome of an ambitious twelve-year multi-method comparative research programme conducted across six European countries between 2003 and 2014, taking a 360-degree look at what Andreas Hepp et al term ‘the communicative construction’ of Europe. It briefly queries, but then takes as given, an emerging European public sphere as ‘a thickened communicative space articulated mainly through certain patterns of transnationalisation’ (6). The book proceeds to examine its manifestations over time, fortuitously capturing the impact of the euro crisis of 2008-11 through the eyes of journalists and the public, coming up with some surprising, even counterintuitive, conclusions. One of the refreshing aspects of this book is that it looks at the flipside of Europe and the European Union. Rather than directly examine its institutions or elites, it listens to those who have to make sense of its complex and changing character, and the citizens picking up and interpreting bits of intelligence here and there as best they can. The six countries selected – Austria, Denmark, France, Germany, Poland and the UK – exhibit a range of views from euro-friendly to eurosceptic, and include both established and newer members of the Union. Fieldwork was extensive. In-depth interviews with 182 citizens of the six countries were conducted in late 2011, augmented by the participants’ own network maps and media diaries. Social media analysis was carried out during the European Crisis Summit of the European Council of June 2012. For a detailed insight into news culture, 216 EU and foreign news editors, chief editors and foreign correspondents from twenty-three quality, tabloid and regional newspapers were interviewed, political news coverage of Europe from 1982-2013 was analysed and newsroom observations took place in two newsrooms per country in 2008 to find out how stories about Europe were being framed. What emerges is a thorough and innovative empirical study, which combines a broad-ranging, erudite and carefully argued cutting-edge approach to theory. There is plenty in here to delight Europhobes and Eurosceptics. Chapter Six, concerning citizens’ ‘communication repertoires’, looked at all forms of mediated and direct communication from the point of view of the individual. Far from being disengaged, everyone, it seemed, had something to say about politics and about Europe. Edgar Davis, 71, a retired engineer from London, relies almost exclusively on the BBC as a source of political information, and argues that the euro is a disaster and that the EU will ‘go down the drain’. Fabrice Gerard, 45, a French business consultant, thinks that national governments will dissolve as Europe unifies. Danish student, Lone Sondergaard, 24, says Greece ‘has made its bed and now must lie on it’. The authors identify three basic types of European public connection that apply across countries: noticing (keeping in touch), centred (concern with a particular issue) and multi-perspective (a small group who seek out a range of often contradictory views). There appeared to be little difference between countries in the interviewees’ mode of connection to, or interpretation of, the euro crisis. This latter finding is surprising, given that three out of the six countries are not part of the eurozone, but this is not an aspect of the issue which the authors consider in detail. It is probably illustrative of the subject of this book that it will be read differently in different countries. I couldn’t help being shocked, disbelieving even, to hear an Englishman, Steven Corner, 20, say that he likes the idea of a united Europe ‘working towards problems as an entire continent. I love that’. Within the mediated political discourses of Britain, this opinion might qualify as ‘mad’. In reality, according to this study, citizens of all countries agree with a European ideal characterised by a common heritage and the need for peace, freedom and cooperation: a principle which the authors describe as ‘a basic legitimizing function’ (228). Although many consider EU politicians and institutions to be ‘second-rate’ and ‘ineffective’, this does not mean that the ideal itself is not legitimate. Chapter Five examines the issue of the mediated representation of Europe, asking how, in their everyday practices, journalists ‘continuously re-articulate cultures of political discourse – national as well as transnational’ (39). The authors find that despite fifty-eight years of European collaboration and integration, distinctive national cultures of political discourse persist. Broadly speaking, Germany, France and Austria normalise European news; Denmark and Britain continue to see Europe as ‘the other’; and Poland takes a hybrid approach but is ‘catching up’ quickly. Overall, as a news issue, ‘Europe increasingly seeps into journalists’ everyday horizons of meaning, resulting in a dispersal of references to Europe across the entire newspaper’ (52) but, as ever, Britain is a ‘special case’ (52), and receives a bit of a ticking off. British journalists, the authors conclude, largely see European countries as a source of humour and absurdity. Even worse, one of the two UK newspapers considered, the Daily Express (The Times was the second), is accused of taking a ‘hypocritical attitude towards the EU’ (68). It would be interesting to see where the Scottish newspapers fit here. The authors’ own perspective also creeps in. Journalistic practices, which ‘routinize’ the coverage of European issues, are seen to be advancing in line with the direction of travel, as opposed to those, like the British, who take a ‘distanced attitude to the EU’ (47). Far from signalling the fragmentation of European identity, this study concludes that the collective struggle on the part of citizens to understand the meaning of the euro crisis is helping to cement it. Could the same be said of the more recent immigration and terrorism-related crises? This book provides a welcome opportunity to catch a glimpse of how ordinary Europeans see Europe at a time of threat and change. It appears that they have more in common than separates them. Ruth Garland is a PhD researcher in Media & Communications at the London School of Economics, researching into government communications.